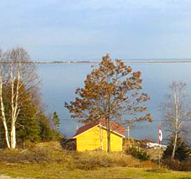 Welcome to Beach View Cottage, located on the South Harbour waterfront on the Northern tip of Cape Breton Island. Here you will find pristine beauty, privacy and a relaxing atmosphere in our spacious, cozy cottage. While staying with us, enjoy the finest in local lobster, crab, mussels, clams and oysters so don’t forget to bring your appetite! Our central location makes us the perfect home base for local activities such as golfing, fishing, hiking, tennis, kayaking, whale tours and beautiful quiet beaches. We are also located 1.5 miles off the world famous Cabot Trail, one of the world’s most famous scenic drives with nearby attractions such as the Highland Links Golf Course and the Acadian village of Chéticamp. Our 2-bedroom cottage includes Double, Queen beds and a 4-piece bath, satellite television, hairdryer, electric fireplace, screened porch, and barbecue. We offer a water frontage with panoramic view of ocean, beach and mountains. Visa is accepted. Cancellation Policy: Must cancel 30 days prior to day of arrival.